Thursday 7th April 2016 Local campaigners are celebrating today after winning their battle to keep a local pub open amid plans to turn it into a convenience store. Friends of The Wellington have received a letter from New River Retail stating that the development company has withdrawn plans to convert the premises to a Co-operative store. Friday 2nd October 2015 A Chesterfield pub is in line to win a national award after being recognised for its commitment to helping the local community. 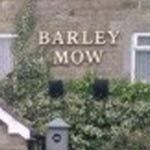 The Barley Mow, in Langer Lane, Wingerworth, is a finalist in Enterprise Inns' Community Heroes Awards, next month. Tuesday 26th May 2015 A brand new pub has opened in Chesterfield following a £300,000 investment of the building. The Burlington, which has been named after the street on which it resides, opened its doors on Friday 22nd May for a celebratory launch party. Friday 6th March 2015 Chesterfield Borough Council has confirmed that it is adding the Wellington Hotel, New Whittington, to its list of assets of community value and has also agreed to issue an Immediate article 4 direction which prevents development on the site without planning permission as we reported yesterday. Thursday 5th March 2015 Beer lovers and their MP are raising a glass as councillors have agreed to grant a popular local pub protected status. The Wellington, on New Whittington's High Street, was brought by a property development company last year who expressed an interest in turning the site into a supermarket. The Wellington's regulars were up in arms over the proposals and formed a campaign group, 'Save Our Welly', to keep the building operating as a pub. 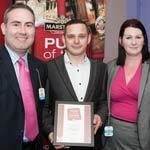 Chandlers Bar Are The 'Ultimate Geeks' Five Years Running! 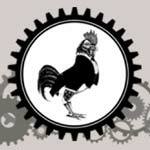 Wednesday 18th February 2015 Chesterfield's very own cocktail bar have recently celebrated their fifth year of running their pub quiz with a twist! 'The Geek Quiz' has been a successful part of Chandlers, it's staff and customers, becoming a social highlight of the week. Offering an ultimate medley of trivia questions, videogame play-offs and bar challenges, the posh pub quiz has gained a reputation for it's outlandish humour, competitive edge and boisterous banter. Thursday 12th February 2015 "We're at the first step - it'll be a long fight - but we're up for it!" That was Andy Bell, from Friends Of The Wellington, as he addressed Chesterfield Borough Council last night in the chambers - during an impassioned and often emotional evening, when local councillors debated the petition to designate the pub an Asset of Community Value, and issue an Article 4 direction preventing development. A campaign to save a New Whittington pub has stepped up a gear, with the support of North East Derbyshire's MP. The Wellington pub has been bought by a property developer - New River Retail - with a view to turning the site into a Co-op convenience store. 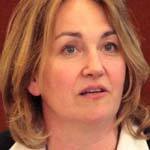 Wednesday 29th January 2015 North East Derbyshire MP Natascha Engel has spoken of her frustration over the government's scuppering of a measure that would help protect community pubs - including New Whittington favourite The Wellington - from being converted to retail premises. MPs voted on an amendment to the wide-ranging Infrastructure Bill last night, which would require planning permission to be sought before demolishing or converting a pub into a supermarket convenience store or other retail premises. 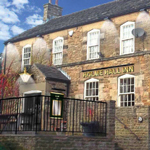 Thursday 11th December 2014 A new family pub and restaurant development has opened on Derbyshire County Council's flagship regeneration site in time for Christmas bringing 47 jobs to the area. 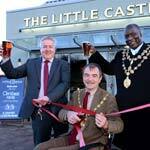 Marston's Inns and Taverns, which provides pubs throughout the UK, selected Markham Vale off M1 junction 29A near Chesterfield to build its new pub restaurant called The Little Castle. Tuesday 2nd December 2014 Celebrations tonight after it was confirmed that Tesco are no longer planning to turn the Crispin Pub into a Tesco Express. As we reported HERE back in March, the pub, on Ashgate Road, has been the subject of a large campaign by residents, who say that it's closure would take away a vital part of the community. Friday 28th November 2014 "People don't realise until these places are gone what a big difference they make! Can we manage without another convenience store? Yes. Can we manage without the Wellington? No!" That was New Whittington resident Dave Tagg speaking at a public meeting attended by over 200 people last night (Thursday 27th November), set up to discuss plans to turn what they say is a 'much needed' community pub into a convenience store - believed to be a Co-op. Thursday 20th November 2014 A campaign has been mounted in a Chesterfield village by residents who hope to save one of their popular locals from being closed - and being re-opened as a convenience store. The Wellington Pub, on High Street New Whittington, is described by campaign leader, Viky Muddiman, as the 'hub' of the community - a place where people go not only to drink, but for food, company and support. 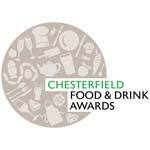 Thursday 14th August 2014 24 food and drink businesses have been shortlisted across nine categories in the 2014 Chesterfield Food and Drink Awards, organised in association with Chesterfield College - headline sponsor of the awards for the second year running. The shortlisted establishments were selected from hundreds of nominations received by the competition organisers, Destination Chesterfield. 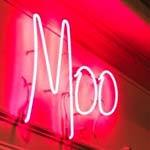 Tuesday 22nd July 2014 Police are appealing for witnesses to an alleged assault in Moo Bar in Chesterfield. Details of what happened are unclear, but officers believe that two groups of people were involved in a confrontation in the early hours of Sunday, July 20th. A 21-year-old man from Mansfield sustained a fractured jaw and has undergone surgery at Chesterfield Royal Hospital. Thursday 17th April 2014 A pub in Chesterfield is to close for 80 hours after they were caught selling alcohol to underage volunteers during a test purchase operation. The Goldminers at Newbold sold booze to the teenagers for a second time in a three month period. 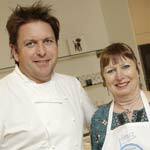 Veronica Prunty from Chesterfield spent the day with celebrity chef James Martin on Friday, March 21st, at an exclusive cooking master class, after winning a competition ran by Vintage Inns during British Pie Week. 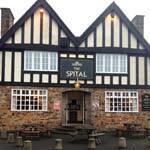 'The Cadillacs' will be cruising to the Spital Pub on Spital Lane. Chesterfield This saturday night. The evening's musical entertainment starts at 9:30pm and promises to be a great night. The Cadillacs, 9:30pm, The Spital Pub, Spital Lane, Chesterfield S41 0HL. A pub Poker player from Chesterfield has secured one of the final places on a trip to Las Vegas! Adrian Fazakerley, of the Dusty Miller pub in Barlborough, won the prize after finishing in the top ten of the 2014 Redtooth Poker Vegas 100 tournament. 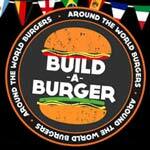 Fancy The Chance To Build Your Own Dream Burger? Thursday 6th March 2014 Ever wanted to make your mark on the menu at your local pub? Well now's your chance. A Chesterfield pub/restaurant is giving local foodies the opportunity to create their ultimate dream burger, which if chosen, will feature in pubs across the nation - just in time to cheer on England during the summer's World Cup football. Wednesday 26th February 2014 Forty-six people have been banned from a number of pubs and bars in Chesterfield in a unanimous decision by the town's Pub Watch members. The individuals, a mixture of men and woman, were originally arrested by police in connection with drugs offences as the result of an operation in the town centre between October and December last year. Two pubs are to close for 48 hours after they were caught selling alcohol to underage volunteers during a test purchase operation. The White Swan at Dronfield and the Whitecotes at Boythorpe, Chesterfield, sold booze to the teenagers for a second time in a three month period. Thursday 28th November 2013 New Whittington social club are organising a 70's / 80's Fancy Dress Disco on Saturday, 21st December from 7.30pm till late - and would like to invite everyone along to join in the fun, and dance the night away! 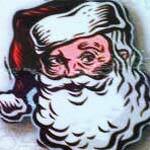 Children are also very welcome, so it's a perfect opportunity to come along as a family and party. Christmas is a time for giving and giving to those less fortunate than ourselves, and several pubs in Chesterfield have entered into the spirit of that this festive season. Historic Public House In Wingerworth Reborn! 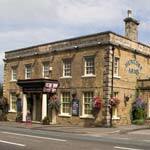 Thursday 7th November 2013 The Wingerworth Pub & Kitchen (formerly known as the Hunloke Arms) is to re-open tomorrow - Friday November 8th - following a £500,000 refurbishment. The Grade II listed building, on the A61 Derby Road, has been brought back to its former glory, on time and on budget, thanks to the painstaking work of a dedicated team. Thursday 3rd October 2013 The award-winning Devonshire Arms at Middle Handley has been given a place in the prestigious Michelin Hotel and Restaurant Guide for Great Britain and Ireland 2014. 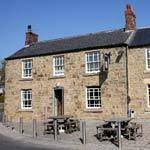 The pub and restaurant in the village of Middle Handley, between Sheffield and Chesterfield, is the region's only new entry into the world famous guide to the best dining experiences. Thursday 8th August 2013 Local residents are continuing to celebrate after controversial plans to convert a local pub to a convenience store have once again been turned down by Chesterfield Borough Council's Planning Committee. 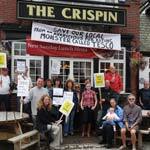 Residents are opposed to The Crispin Inn on Ashgate Road being turned into a local Tesco store, believing that to do so would have a detrimental effect on the local area and remove what is seen as a local community pub from use. Wednesday 7th August 2013 It's a pub familiar to many of us in Chesterfield and it's been announced that The Hunloke Arms, a Grade II listed historical public house, is currently undergoing a half million pound refurbishment. Situated on the A61 Derby Road, just 2 miles south of Chesterfield in Wingerworth, the refurbished premises, is to be called "The Wingerworth Pub & Kitchen" - and will become a major new local food and drink venue. 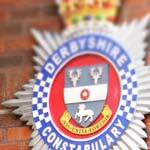 Thursday 1st August 2013 You can still be over the limit many hours after your last drink - that's the warning from Derby and Derbyshire Road Safety Partnership following news that nearly a fifth of people would simply tell their designated driver to wait a while before driving if they'd had one too many. Saturday 15th June 2013 The Village Bar, Clowne, is pleased to announce they will be hosting an evening with ex Spireite legend Jack Lester on Monday 17th June starting at 7pm. Tickets for the event are priced at £40 each and this will include a 3 course meal, 'meet and greet' with Jack plus photo and autograph opportunities, followed by an after dinner talk from the Legend himself. Join St George For A Late Full English! Monday 22nd April 2013 What better way to celebrate St George's Day than with that great culinary tradition, the Full English Breakfast? But if you're one of the millions who now claim they're too busy for a sit down meal at daybreak, you can still tuck into the full works a little later in the day with the team at The Devonshire Arms at Middle Handley. Thursday 11th April 2013 The Holme Hall Inn (formerly, the Holmebrook Tavern) is set to have its grand re-opening on Friday 12th April after a major joint investment of £200,000 by new licensees Embankment Inns Ltd and owners Punch Taverns, one of the UK's leading pub companies and as a result, approximately 15 new jobs have been created. Inside, the pub has been completely redecorated in a contemporary style throughout. 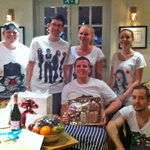 Wednesday 10th April 2013 The team at award winning pub and restaurant, The Devonshire Arms at Middle Handley, put a smile on customers' faces as they raised more than £500 for Comic Relief. Head chef Tom Lawson, sous chef Craig Middleton, junior chef Simon Maw and commis chef Jodi Wilson competed against each other in a Great British Menu style competition, to create a series of dishes that were served at a special Red Nose Day dinner. Friday 22nd February 2013 Acclaimed experimental acoustic trio Florin present a live session at The Devonshire Arms Middle Handley on Friday, March 1st. 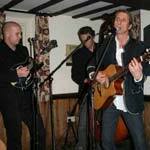 Lead vocalist and guitarist Bob Humphries, double bass player Martin Crofts and on mandolin and vocals, Rob Dickson will be performing at the award winning pub and restaurant from 9pm. "Great food and free music is proving to be another popular choice at the Devonshire Arms," said manager Alistair Myers, "Come along and join us for what will be an excellent evening." Call (01246) 434800 for more information. 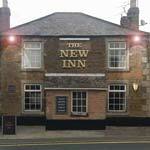 Tuesday 25th September 2012 The New Inn pub, in New Tupton, is looking for a new tenant! Situated in a densely populated residential area with only 1 other local competitor, the pub is a traditional suburban community 'wet led' pub which will benefit from a substantial redevelopment scheme to refurbish all internal trading areas, including fitting a fully fitted commercial kitchen, all new fixtures and fittings and refurbishment of the external elevations including new signage and lighting. 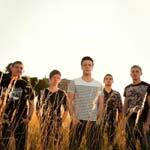 Wednesday 13th June 2012 Take The Seven play at the Wellington, High Street, New Whittington on Saturday 16th from9pm - a 5-piece rock/alternative band with a distinctive style, sound and show, it promises to be a fantastic night. Based around Chesterfield and Sheffield, the band have now been together for just under a year, working hard to write and record original material. Monday 7th May 2012 A New Whittington pub that has just been named as a runner up in the regional Community Pub of the Year awards, has dedicated the honour to its customers. Michael Storey, who runs The Wellington Hotel with his mother Barbara Yorke, learned of the pub's success at the Marston's Pub of the Year ceremony held in Doncaster. Monday 19th December 2011 A Chesterfield couple is to star in a recruitment campaign by Punch Taverns, aimed at stressing the benefits of a career in the pub trade. Helen and Andrew Mason both left careers with supermarket giant Asda to run the Telmere Lodge in Hasland after wanting to spend more time with their children. 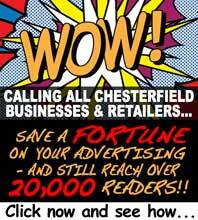 Tuesday 13th December 2011 We have long been told that Chesterfield's economy continues to thrive despite the recession. And one young couple have taken a chance on that - and are set to re open a favourite drinking haunt in the town. 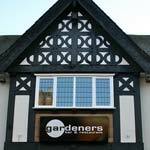 The Gardener's Arms on Glumangate has just undergone a huge refurbishment and upgrade and will open on Friday 16th December at 11am. High Street, New Whittington, Chesterfield, S43 2AN. 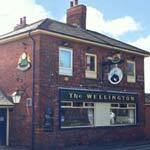 The 'Welly' is a traditional, family run pub in the village of New Whittington, on the main bus route from Chesterfield Town to Eckington.